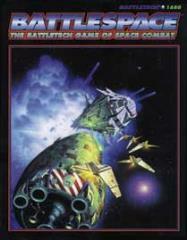 BattleSpace is the game of space combat between JumpShips, DropShips and WarShips in the 31st century. Fully compatible with BattleTech, this large-scale ship combat game adds a new dimension to the wars of the future. This boxed set includes a rulebook/sourcebook that provides the history of naval warfare and the statistics and descriptions of ships currently in use in the Inner Sphere; two 22" x 34" full-color map sheets; color counters with stands; ship record sheets; and dice.